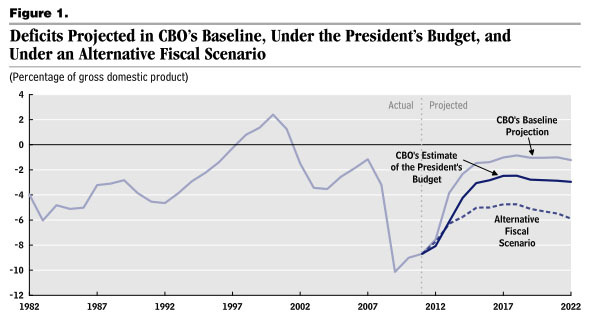 In case you’re curious, here’s CBO’s take on President Obama’s proposed budget. The light blue line is their “baseline projection” which assumes that all current laws stay in effect forever and the Bush tax cuts all expire at the end of the year. It shows the federal deficit nearly disappearing by 2017. The dashed line is their “alternative scenario,” which assumes extensions of the Bush tax cuts and a few other things as well. It shows the federal deficit improving a bit, but then deteriorating to 6% of GDP by 2022. The dark blue line is the Obama budget, and it’s somewhere in between. But here’s an important point that you can’t see just from looking at the chart: Obama’s budget reaches primary balance in 2018. This means that federal spending is in balance, and the only source of the deficit going forward is interest payments on the national debt. At that point, the debt-to-GDP ratio is stable. That’s a big milestone. The truth is that it’s not really that hard to reach long-term balance. If we simply sit back and do nothing, the budget would basically be balanced by 2015. Even if we just allow the Bush tax cuts to expire — all the Bush tax cuts — it would be a huge step forward. Since the economy will probably still be a bit fragile by the end of the year, my preference would be to phase them out over the course of, say, three years. Combine that with spending cuts that Democrats and Republicans have mostly agreed to already and we’d be nearly the whole way there. All that’s left then is reining in rising healthcare costs. But then, that’s really all that’s ever been left. When it comes to the federal budget, it’s all healthcare, baby. It always has been.